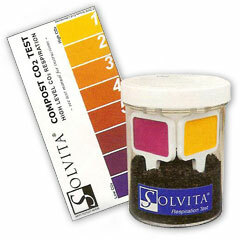 A true scientific breakthrough, the Solvita Compost Maturity Test is simple to use, economical and reliable. This new product helps both users and producer reach new quality standards for a finished compost product. Using white LED coupled to matrix-array optics the DCR reads Solvita® colour chemistry at unrivalled accuracy, speed and low cost. Using the USB lead you can then upload to your PC the actual numbers for each test sample. Solvita® is recognised worldwide as a valid test for stability and maturity of composted products. The new DCR reads Solvita® Test paddles to +-0.01 readability and +-0.05 unit precisions. 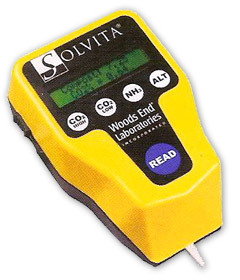 In addition to displaying accurate colour numbers the Solvita® DCR can give compost emissions of CO2 in %, soil respiration as ppm CO2 per day and micrograms of volitised NH3-N.
New versatility is afforded by being able to use these measures to accurately estimate oxygen demand in composting (ref Chart 2), N-losses, and the expected release of seasonal soil-N. Routine lab precision is obtained with Solvita® + DCR by weighing in samples, which enables calculating product stability with industry standard units, e.g. mg CO2-C/g/day. Makes it easy and very affordable for anybody to accurately evaluate compost. In the time of less than one day for sampling to end-result, you acquire important and very useful information about the status of your compost that you cannot get elsewhere. Adds a new and exciting dimension of precision and enhanced capability onto the solid and proven Solvita® base and completes with the accuracy of laboratory methods. Has been uniquely designed by compost scientists familiar with compost manufacturing and quality control needs. Puts highly relevant, lab-level quality in your hands in the field, when you need it. New technology for measuring soil C and N mineralisation potential. 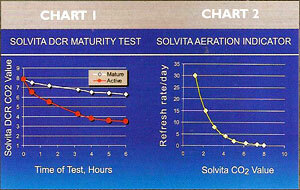 Solvita® - innovative rapid test for 24 hour CO2 burst. Soil studies have shown the utility of testing CO2 respiration as a means to gauge active soil carob and potential release of nitrogen. Recent research shows that the CO2 burst from short-term drying-rewetting accurately predicts N+P mineralisation, and is superior to current estimates of N-Min potential from soil organic matter. The Solvita® procedure combines these findings with modern technology in reliable, simple to use process which can be preformed fairly rapidly at a significantly reduced cost compared to traditional lab respirometry. Weigh in dry soil, Place in jar Add H2O Insert CO2 sensor Incubate at 25°C Read CO2 ppm at 24 hr. Solvita® and Woods End are registered trademarks of Woods End Research Laboratory.